Port Macquarie trainer Marc Quinn doesn't think the step up to 2000m will pose any problem when his in-form gelding Cogliere lines up in Sunday's $80,000 Stacks Law Firm Taree Cup. Cogliere, winner of the South Grafton Cup (1610m) two starts back on July 8 before his latest 1.5 length third behind Glitra and Curragh in the Coffs Harbour Cup (1600m) on August 2, is yet to win beyond 'the mile'. His two previous runs over longer trips in November last year resulted in an eighth to Carzoff over 1800m at Rosehill and another eighth to Miss Dubois in the $200,000 Country Classic over 2000m, also at Rosehill. Cogliere was beaten just over four lengths on both occasions. But Quinn doesn't think those performances are a true guide to his ability to handle a middle-distance test. "I had originally planned to set him for the Port Macquarie Cup last year but when they announced that TAB Anniversary Highway to be run at Randwick over 1400m in October on the same day as The Everest, the $200,000 prizemoney for country gallopers was too good to ignore so I kept him to the shorter trips and aimed him for that," said Quinn. Cogliere subsequently ran seventh to After All That in the Anniversary Highway on October 14, the day Redzel won the inaugural running of the $10m The Everest. Cogliere winning the 2017 MNCR Country Championships Qualifier at Taree. Credit: Ashley Images. "After the Anniversary race he stepped up in distance so he didn't really have the best prep going into that Country Classic over the 2000m last November. And he's certainly a much better horse this prep." Quinn admits Cogliere's barrier 13 in the Sunday's race is not ideal but believes if the pace is on and jockey Matt McGuren can get some cover, the gelding will be competitive. "The draw is what it is - I'll leave that up to Matt - but I'm confident he'll run the mile and a quarter (2000m). Hopefully he can settle midfield with cover with the speed on and with any luck he should be right in the finish," he said. The form around Cogliere's recent performances is certainly very strong. 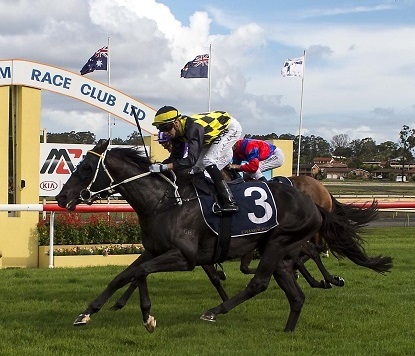 Five starts back he beat recent Randwick winner Bergerac over 1600m at the Sunshine Coast. He then beat Brazen and subsequent winner American Diva in the South Grafton Cup and the form out of the Coffs Harbour Cup looks particularly strong with Glitra then coming out to win in Brisbane last Saturday. Quinn is hoping Cogliere can repeat the performance he produced at his only previous appearance at Taree back on February 26, 2017 when he powered home from back in the field to win the $100,000 MNC Country Championship Qualifier (1400m). "That was one of his best performances," he said "He's always shown ability and has now matured into a really nice horse who I think, over the next 12 months, can win some good races. Hopefully that starts on Sunday with a Taree Cup win." All being well after Sunday's assignment, Quinn will give Cogliere a freshen up and prepare him for his hometown $150,000 Port Macquaire Cup (2000m) on October 5. Wyong trainer Damien Lane and jockey Travis Wolfgram are searching for back-to-back Taree Cup wins with All But Gone, a last-start eye-catching fourth at big odds in Glitra's Coffs Harbour Cup. Lane and Wolfgram combined last year to pull off a shock win with Pirate Ben, a $31 outsider in the race. Sunday's eight-race Showcase Taree meeting also features the running of the $35,000 Mid Coast Automotive The Manning Lightning (1000m) and sees the return to NSW of veteran Coffs Harbour sprinter Plateau Gold. Nine-year-old Plateau Gold is back with his Coffs Harbour trainer Jim Jarvis after a 10-month stint in Victoria with the Quinton Scott stable. He showed two starts ago that he still had plenty of zest for racing with a win over 1000m at Geelong. Plateau Gold, topweight with 58.5kg after apprentice Lexi McPherson's 3kg claim, chases the 13th win of his career in Sunday's sprint, a race he won in 2016. He also finished fourth behind Arise Augustus in last year's event, carrying 62kg and jumping from a wide gate. He has drawn ideally in gate two this time around. View the fields and form (include race replays) for Sunday's Taree Cup meeting here.